Being Bartman: 'Catching Hell' Tells Cubs Fan's Story Steve Bartman deflected a foul ball during a playoff game in 2003. The Chicago Cubs went on to lose that game, and Bartman's fellow fans vilified him. A new documentary asks whether Bartman can forgive those fans for making him a scapegoat. As the Chicago Cubs' Moises Alou made a leaping attempt at a pop foul during the National League Championship Series, Steve Bartman (in Cubs cap and dark sweater) was among the fans reaching for the ball. While one image suggests he acted alone, the second photo tells another story. We fans of the Chicago Cubs rarely hear good news in October, so there's a little buzz of excitement around Wrigley Field these days about the possibility of Boston Red Sox GM Theo Epstein reportedly coming to Chicago to take over a similar or expanded role with the hapless Cubs. In 2004, Epstein helped guide the Red Sox to their first World Series title in 86 years and to another title in 2007. In Chicago, he'd be trying to end a Cubs' championship drought dating back to 1908; the Cubs haven't even been to the World Series since 1945. The last time the Cubs came close was eight years ago, and a new ESPN documentary revisits that painful event in Cubs history and the anger directed at one fan in particular, Steve Bartman, who interfered with a foul ball and unwittingly became the latest scapegoat for a century of baseball futility. The Cubs were five outs away from advancing to the World Series for the first time in 58 years; the Marlins had a runner on second with one out, when Luis Castillo hit a fly ball in foul territory down the left field line. The Cubs' Moises Alou ran over to the stands and reached up with his glove — just as a bunch of fans reached up, too. And one of them, Bartman, 26, deflected the ball, preventing Alou from catching the second out of the inning. The crowd's cheers turned to boos. Alou went ballistic. And FOX Sports showed replays over and over. Fans turned on Bartman, booing, chanting obscenities and throwing beer at him. "I was pretty PO'd," says fan David Beaudion, 32. With a laugh, he adds, "I threw the remote and turned the TV off." At O'Donavan's, a Chicago bar about a mile and a half west of Wrigley Field, Beaudion remembers the play rattling the players. "It threw everybody off of their game, and nobody was prepared for that," he says. "You know, I mean, you saw Alou's reaction to the whole play; he was furious." The new documentary, Catching Hell, by Oscar-winning filmmaker Alex Gibney, shows how Alou's fit on the field sparked a nasty reaction by fans, who turned on Bartman. Wearing headphones over a Cubs cap, glasses and a green turtleneck, Bartman stood out in the crowd. For his safety, security escorted him from the stadium. The next day, The Chicago Sun-Times published his name, the suburb he lived in and where he worked. TV crews camped outside of his house. Reporters hunted down his friends, neighbors — even the Little League team he coached. Bartman and his family got death threats. He's gone pretty much underground ever since. Cubs fan Mary Beaudion says she hasn't seen the documentary yet, but she does look back now on the fans' reaction with a little remorse. "You know, this poor guy. I mean it was so much hatred toward him and so many mean things that were said, it was like ... He could have been suicidal. I know I would have [been]; all of Chicago now hated you and it was your fault. They blamed him," she says. "I kinda did." Her husband, David Beaudion, adds, "He can be forgiven." But Catching Hell doesn't ask Cubs fans if they can forgive Bartman. Rather, it asks if Bartman can ever forgive Chicago fans. "I think they reacted poorly; I really do," says lifelong Cubs fan Patricia Reardon, who grew up in the shadows of Wrigley Field. Now in her 70s, Reardon seems embarrassed by the scorn her fellow fans directed at one of their own. 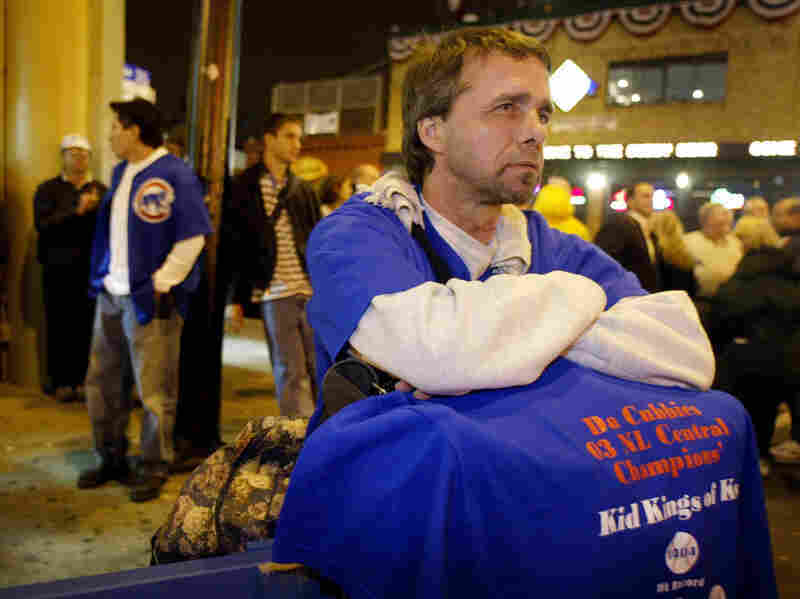 Ted Zegarski and other dejected Cubs fans hang out in front of Wrigley Field as the Chicago Cubs were beaten by the Florida Marlins in Game 7 of the National League Championship Series on Oct. 15, 2003. "Poor guy," she says. "I feel sorry for Bartman, and it was a very sad situation — for Chicago and Bartman." Reardon's daughter, 50-year-old Julianne Reardon, agrees. And she blames the media for fueling the fire. "They played that scene, that one play, over and over and over again. And then they gave his name out and then they told what he did," she says. "They just gave; they divulged so much information about him." In Catching Hell, Gibney compares Chicago's scapegoating of Bartman to that of Boston Red Sox first baseman Bill Buckner, whose error in the 1986 World Series led to his team's collapse, and Red Sox fans to run him out of town. Buckner was exonerated when the Red Sox won World Series titles in 2004 and '07. Now, he's cheered by most Boston fans. Could the same thing happen with Bartman, now that Epstein appears headed to Chicago? "They have to reconstruct the team. They had a horrible year this year. But we still keep going back for more," laughs Julianne Reardon. Cubs fans — even Steve Bartman, I hope — are nothing, if not eternally optimistic.